xi+318 pages with diagrams and index. Octavo (8 3/4" x 5 3/4") issued in purple cloth with gilt lettering to spine. Translated by Mary Lasher from the Russian edition. 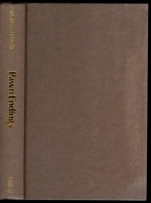 (Lusis: 1106) 1st British edition. Translation and revision of selections from Shakhmatnye okonochaniye edited by Yuri Averbakh, Moscow, Fizkultura, 1956-62 in 3 volumes. A revised and updated translation of the first volume of the Russian treatise. The examples have been renumber in a simpler form (than the Russian edition) with many new examples added; these changes are listed in a comparative index. 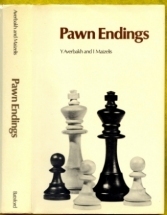 This is the first volume in end game series by Averbakh. Tape stains to paste downs, some sunning to covers. Jacket price clipped. A very good copy in a near fine jacket.